Small-town event at the local library. 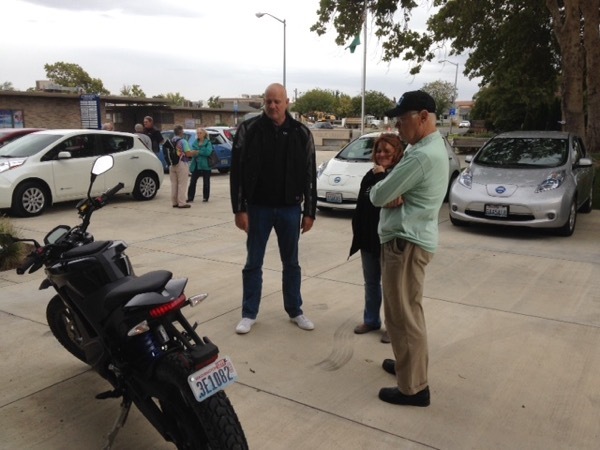 We had more EVs participate (10) this year than last year, plus one motorcycle. In spite of the horrible weather (dust and 35+ mph winds), we had about 50 people attend the event. Family-friendly event in front of the Richland Public Library. There will be various plug-in electric vehicles (PHEVs) displayed and a presentation about current and future electric vehicles. Come and learn about current EV's in an informal Q&A session with owners. Everyone is welcome. For more information, go to: https://driveelectricweek.org/event.php?eventid=638. If you can attend, bring an EV, provide assistance, perhaps even allow test drives, please sign up as a volunteer at the above website. Also, we need as many EV owners to show up and display vehicles. Please show up by 11:30am Saturday so that we can park all the cars in a row. I will have a small table display of EV information. Feel free to bring anything you think might be of interest to the public, portable charging cables, etc. Registered attendees report 78,171 electric miles driven.